[gt3r] You just finished a long year of campaigning a full season (2003) in the ALMS can you talk about the experience, differences to the European circuits, etc? I love racing in the US and Canada. The circuits themselves are not so different in character although in many cases the condition of the tracks or the facilities are not as good as in Europe. This has a hidden benefit though in that they are also largely unspoilt; to the driver that means more fun to drive. Because on average I would say Oval racing is bigger than Road racing in the US, that means the investment is drawn more to the oval tracks leaving the road courses quite original. Contrast this with Europe where typically F1 attracts the development and road courses have in many cases been spoilt through increased safety measures and measures designed to slow F1 cars. So, somewhere like Road America represents your typical road track in Europe such as Spa whereas most other tracks such as Mosport or Road Atlanta are more like the less high profile Brands Hatch or Oulton Park; great to drive but generally lacking in modern facilities. [gt3r] Talk about your European experiences, British motorsport activities with the GT3 R? 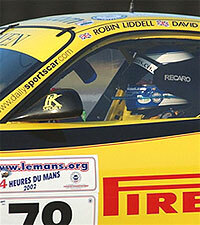 I only had one race in the British GT Championship in a GT3-RS which was at Oulton Park, 2002, which I won in the wet. In 2001 I won the ELMS GT title in a GT3-RS with 2 poles at Estoril and Most and a class win at Most sharing with Mike Youles. 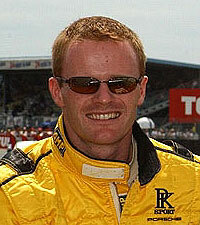 I also drove for Freisinger 2 races in 2001, one with Ortelli when we finished 2nd at Nurburgring FIA GT, and 2 times at Le Mans for PK Sport 2002/2003 finishing 6th in GT in '03. Also I drove for Cirtek at Anderstorp FIAGT in '02 with John Nielsen, and EMKA at Donington also FIAGT where I lead and had fastest lap. [gt3r] Each trip to LeMans 24 hour has been in a GT3 R, what were the challenges in a GT car, in a Porsche, other stories associated with it? The challenges are to be honest much the same as anywhere else, except on average you are travelling faster. As ever the Porsche is a fantastic proven race winning package for endurance racing but unfortunately we had some issues causing lost time in the pits. The Porsche curves are amongst the most challenging sequence of corners in the world and the Porsche is particularly good fun to drive through there. [gt3r] What did the "wide track" suspension do to chassis dynamics? Very little to be honest; I would say it helped rear end stability particularly towards the end of a stint and probably gave the front of the car a little more support but the wheel rates themselves are largely similar. [gt3r] What other Porsches have you driven? 911 GT2. PK Sport British GT '99 3 races. [gt3r] Describe your impression of the GT3 R, handling characteristics, power, aero, etc? Without question it is the most challenging car I have ever driven; to be really fast not just quite fast consistently takes a real balance of aggression and great discipline moreso than any other car I have any experience of. [gt3r] You have mentioned wanting to compete in the World Challenge GT series in the future, why? I like racing and I like battling! [gt3r] How does the GT3 R compare to the Ferrari 360 Modena, as well as the BMW M3? Not completely sure as I haven't driven either but evidently the BMW is an excellent package with a very good chassis as is the Ferrari. I think the Porsche still has the edge especially on engine side. [gt3r] Is there anything in the car that needs improvement, or something that you would want to see in future GT3 Rs? Chassis could improve, or could it?! Seating position could improve; it makes my back ache. [gt3r] How far off is the GT3 R off its GT3 street counterpart? Well I would say one is a racing car based on a road car and the other is a road car so quite a long way off within the parameters allowed. [gt3r] other thoughts?comments? future goals with Porsche? Factory driver? Le Mans Winner? after all since you asked me these questions I have won Daytona!! No really I am very lucky to have had the opportunities I have already had but I am nowhere near finished.